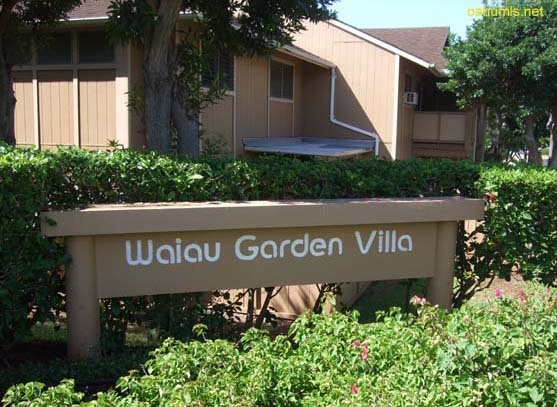 Waiau Garden Villa townhomes were built in 1980 and are on the mauka side of the H-1 freeway in Pearl City. Waiau Garden Villa townhomes feature two and three bedroom units with floorplans ranging from 926 to 1,278 square feet. The upstairs units have high ceilings, providing a spacious atmosphere. Ground floor units have lanais accessing the grassy courtyards. Waiau Garden Villa two bedroom townhomes have one parking stall and the three bedroom townhomes have two parking stalls. Amenities include a swimming pool, barbeque and recreation area. Waiau Garden Villa is a pet friendly property! Waiau Garden Villa townhomes were originally leasehold properties. The majority of the owners have purchased the fee simple interests. Listings above are all fee simple. For leasehold listings, please contact us.